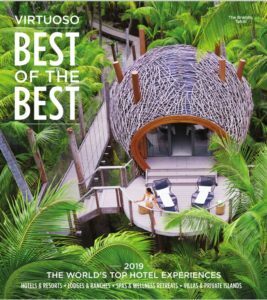 Virtuoso is a network of the world’s finest travel companies. It’s a by-invitation only organization through which member travel advisors have privileged access to exclusive amenities, travel offers, and rare experiences that you can’t get on your own. Get ready to take your travel adventures to a new level. Learn more about Virtuoso. The Virtuoso Adventure Travel Community brings together advisors and partners with a shared passion for adventure and active travel experiences, including those focused on nature, exploration of unique cultures, and physical activities. Adventure Travel partners offer exciting experiences for clients who enjoy being a part of the action. The Virtuoso Culinary Travel Community is the perfect pairing of advisors and partners who have a shared passion for epicurean travel, featuring experiences that go beyond traditional dining with well-rounded culinary experiences that are immersive, interactive and educational. The Virtuoso Family Travel Community brings together advisors and partners with a shared passion for family travel. The partners in this community offer well-rounded family experiences designed to foster deeper connections and lasting memories for the whole family. The Virtuoso Wellness Travel Community focuses on experiences that restore travelers’ mind, body, and spirit. This portfolio integrates nutrition, healing, mind/body balance, fitness, and educational components and partners must meet a stringent set of criteria to prove a comprehensive wellness experience.